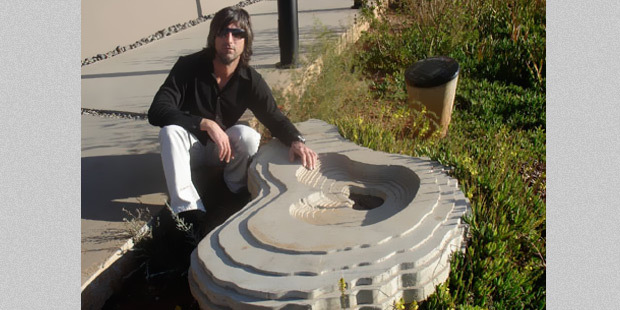 Marco Cianfanelli with the contoured concrete memorial he sculpted in honour of Raymond Dart, who discovered the Taung Skull, proving that Africa is the birthplace of humankind. 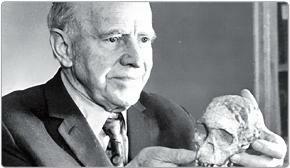 On December 23 1924, Raymond Dart discovered the Taung skull, which proved humankind began in Africa. Using one of his wife's knitting needles, he scraped through rock for 73 days to reveal the million-year-old face of an early human baby with a full set of milk teeth. Dart later wrote, "I doubt if there was any parent prouder of his offspring than I was of my Taungs [sic] baby on that Christmas of 1942." Published in Nature on February 7, 1925, this was the first proper public paper by Raymond Dart announcing his discovery, and the start of the entire Taung story. In this extract from his book, 'Adventures with the Missing Link', Raymond Dart describes how experts corroborated his original opinion that Australopithecus was about one million years old. Only Raymond Dart could show Africa had brought forth the first human species, writes Phillip Tobias in the fifth anniversary edition of the journal, Science. Chris Barron tells the story of Raymond Dart’s discovery of the Taung child. Raymond Dart used one of his wife’s knitting needles to prove that humans originated in Africa. Marco Cianfanelli is fascinated by the act of romanticising space. The different layers of skull shapes in Cianfaneli's commemoration of Dart, aims to reflect that humans originated in Africa. "I stood in the shade holding the brain as greedily as any miser hugs his gold." In this lesson plan, learners will become familiar with the story of Raymond Dart's defiance of accepted "scientific" wisdom. Very few people believed what Dart had to say. For 25 years he was ridiculed by many other scientists. But in the end he was proved right. It turned out that the other scientists had been taken in by a fraud! It's vital to be aware of how prejudice can cause us to make errors even when we think we are being scientific.